We spent the Memorial Day weekend in Virginia. During our vacation we drove the entire length of Skyline Drive from Front Royal, Virginia, to Waynesboro, Virginia. We spent two nights in Alexandria, VA. We visited with my cousins, Vernon and Wendy, and their 2-week-old son, Aiden, on Memorial Day. We left home, en route Front Royal, Virginia, around 12:30 PM on Friday, May 27 . We reached the Quality Inn Skyline Drive approximately 6 hours later. The drive (yes, we drove the car; we did not ride the motorcycle) was uneventful, although we did run into a few heavy downpours. I am happy that we weren’t riding the motorcycle through those heavy downpours! As soon as we checked into our hotel room, we went to dinner. The hotel clerk recommended the Main St. Mill Restaurant, which was within walking distance of the hotel. The restaurant was located in a renovated feed mill. 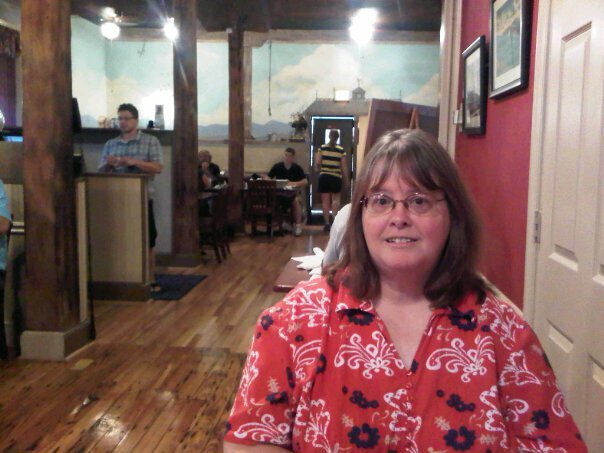 Here’s a picture of me that Bob took inside the the Main St. Mill Restaurant. I liked the restaurant’s tall ceilings, exposed wood posts, the wood floor and the wrap-around wall mural. Bob and I each ordered a grilled chicken breast dinner. The service was excellent, and the food was good. Our hotel was located about 1 mile from the entrance to Skyline Drive. On Saturday, after breakfast at the hotel, we left for our all-day drive on Skyline Drive (the subject of my next Memorial Day weekend blog post). Before leaving Front Royal, though, I took a couple pictures of the court house. The Warren County Court House was built in 1936. Hi Linda. Sounds like you had a great Memorial Day weekend. Of course we missed it here in New Zealand. I really love your last shot of the courthouse. I love restaurants that have been converted from buildings from another era. I'm glad you had a wonderful time. I enjoyed this post Linda, looking forward to the next one. Linda, nice post on Front Royal. We always drive thru there on the way to the Skyline Drive. Next time we might be meeting each other. How fun to be on vacation and enjoy new places and new restaurants. That is a very cute picture of you in the restuarant! Sounds like you are having a great time – so happy for you! Looks like a fun restaurant! I really love old-fashioned restaurants. You take great pics and really invite us into your area, and I love that part of your posts. We usually go to VA for our summer trip with our kids, but with Arielle leaving for college in August, we aren't sure where we're going this this. The photos make me want to follow in your footsteps though!